Soaking up those last few rays & being crafty! I have to say.. one of the things I'm most excited about with blogging is the linky parties! How fun to have a little online pow wow with some ahhh-maaazing teacher blog buddies! So, I was so excited to see Tara over at 4th grade frolics share her Monday made its! So here are some pretty nifty additions to my new classroom this year..
My brown polka dot valances! (The boring number line has since been taken down!) I was pretty proud of myself for quickly whipping together these wonderful no-sew curtains to match my classroom theme this year. I do not claim to be a master sewer in any way, so I thought I did a pretty good job if I do say so myself (pat on own back!) I love that they are simple, and now with my entire classroom they look perfect!! Enjoying the POOL! 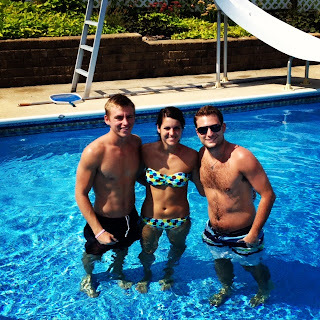 Here's my seeeester-in-law's boyfriend, SIL, and hubby (told you he was handsome;)) They're all pretty great, huh?! We had a wonderful day laying out and catching up in the pool (they live 2 hours away), cooking out, and eating lots of food! They even made a visit to my classroom to see what I've been up to! Cute curtains! I think we are going to be your first follower! I love the pick me sticks...too cute! 4321Teach: Thank you!! I absolutely love the curtains and I was pretty proud of them :) Thanks for being my first follower! !